Bayern Munich defender Jerome Boateng has explained what he told Manchester United manager Jose Mourinho as he snubbed a transfer to Old Trafford this summer. The Germany international has revealed a personal phone call with the United boss to explain his decision not to make the move to England this summer despite being honoured by Mourinho’s interest in signing him. 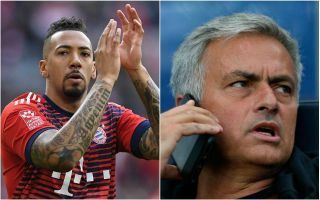 ‘I called Jose Mourinho, I told him that his interest was an honour for me and thanked him for trying so hard for me,’ Boateng told German outlet Bild, as translated by the Metro. United could really have done with a defensive addition like Boateng, who has long been regarded as one of the finest players in the world in his position, despite some recent fitness struggles. MUFC were linked with a host of other names at the back over the summer, with Mourinho having to rely on the unconvincing Chris Smalling, Phil Jones and Victor Lindelof. The Portuguese even resorted to moving midfielder Ander Herrera into a back three in the recent defeat against Tottenham, such was his shortage of quality options. It’s debatable if Boateng would have been the ideal solution anyway, but this snub is just one of many frustrating events that has led to United’s poor start to the season.